We continue to offer canning workshops at various faith group locations. So far, we've offered 3 workshops (sour cherry jam and preserved pears) and have plans for two more in the upcoming month. Stay tuned! Food as a moral movement. Growing veggies on faith home grounds Grace Lutheran's straw bale project, Highland Baptist Community Garden, Westdale United etc. Growing food in community -Hill St. Park community garden (faith group collaborative). Eating locally (Environment Hamilton). Gardens for newcomers (Hughson St Baptist church). Good Food Box. Fruit tree picking project. 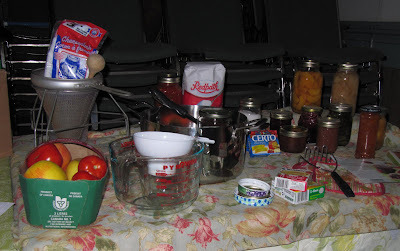 Canning and preserving, (Environment Hamilton). Sacred Heart's farmer's market and more! Come out and learn from community leaders about what area faith communities are doing to help create food security for all people. Visit booths and displays, enjoy light refreshments. All welcome! Over the weekend of September 17, 18, 19th, Greening Sacred Spaces Hamilton invites people of all faiths to travel to worship that Friday, Saturday, and Sunday on foot, by bike, by public transit or carpool. Your faith group will be competing against other Hamilton faith groups for a chance to win a prize for your place of worship. 4 x $25 coupons towards a Green Venture residential Ontario Home Energy Savings Program energy audit. We are seeking donations of more prizes so if you have any leads please send them on to me! !